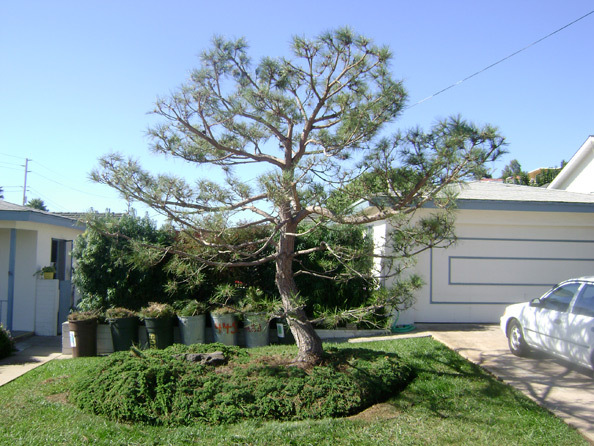 Japanese black pine immediately after pruning/lacing/shaping/grooming, a couple days after pruning begun. Purpose: to get it ‘on the path’ to a more classical ‘oriental’ style, which can take several years. In Pt. Loma, autumn 2008. 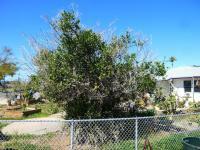 Also see photos 21-23, which is 1 1/2 years later, and photo 34 which shows the tree 4 years later, in December 2012. In this photo, #1, about 3/4 of the foliage was taken off, - this is contrary to some 'party line' industry standards, but, this degree of trimming is sustainably very tolerable with some bushes, trees, and other plant types, when done judiciously at appropriate times no more frequent than necessary, which could only be once, or at seasonal/annual intervals for some plants; and is appropriate for some intents, and typically only worthwhile with trees and bushes under fifteen feet, but there are larger exceptions. 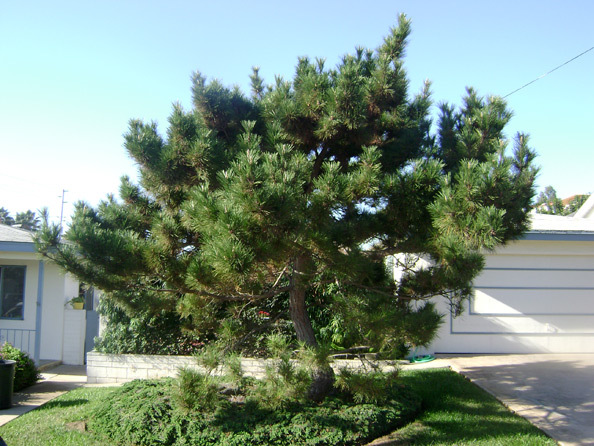 Same Japanese black pine immediately before pruning/lacing/shaping/grooming. 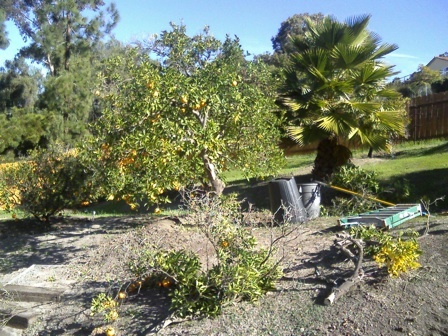 Old tangerine tree, Encore variety, before pruning in photo at left, and after pruning in next photo below, - an extraordinary transformation. Spring 2013. 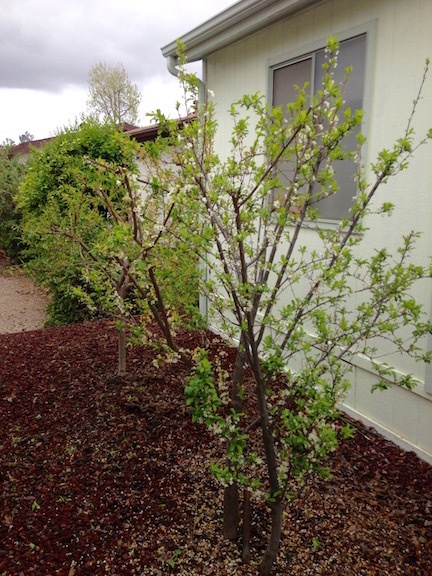 After pruning, later the same day, with mulch put on the surrounding soil. An extraordinary transformation. 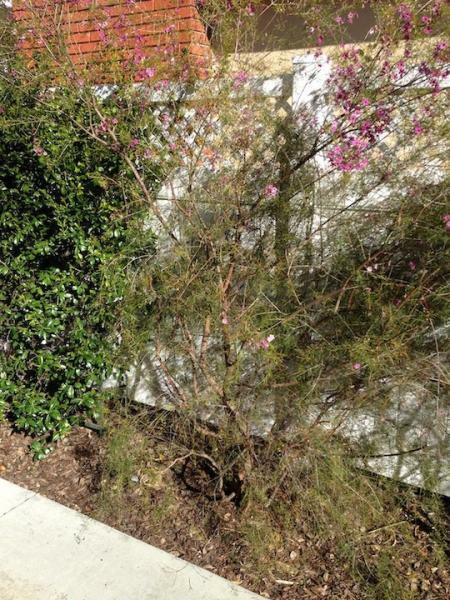 Spring 2013. 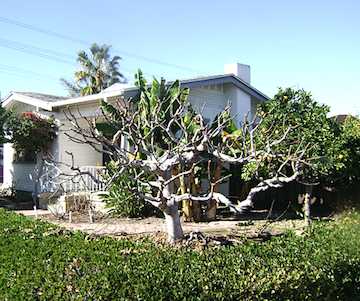 Black Mission Fig before pruning, Normal Heights, January 2009. 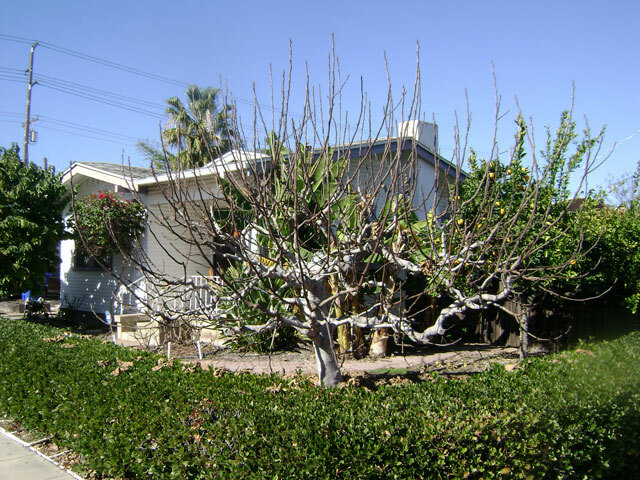 Pruned each year since 1992. 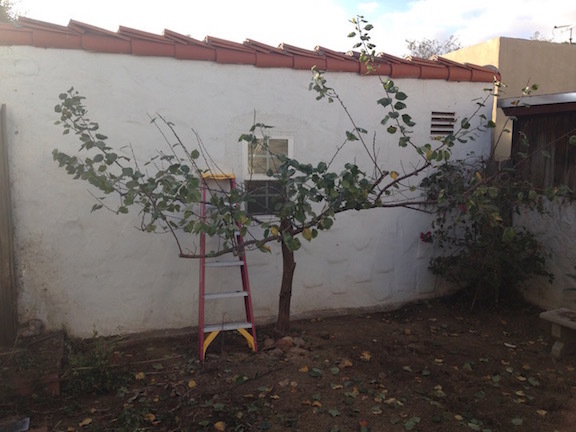 Fig tree in Lemon Grove after pruning. Cut limbs seen on ground. 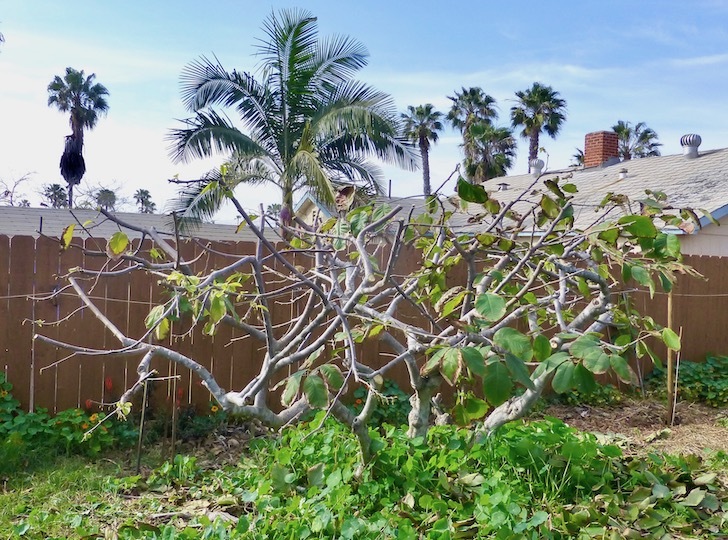 This was a 'lite' pruning wherein the owner wanted the tallest limbs cut out, and a little bit of thinning of crossing limbs, and a bit of cutting out of low or over-extended lateral limbs. December 2018. 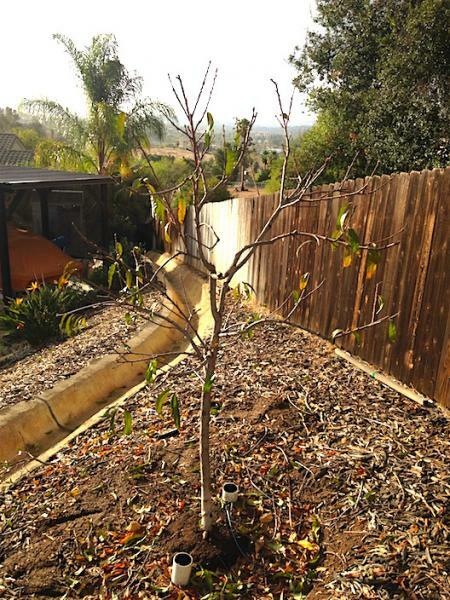 Nectarine tree in Vista, November 2016, immediately after pruning. The owner requested it get a modest pruning even though the leaves hadn't dropped yet,.... and that's fine to do. I didn't take a 'before' picture, but you can see the trimmings on the ground. 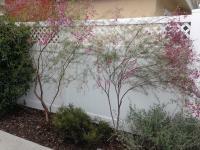 What I did was reduce the size/height about 2 feet, along with some thinning/lacing. 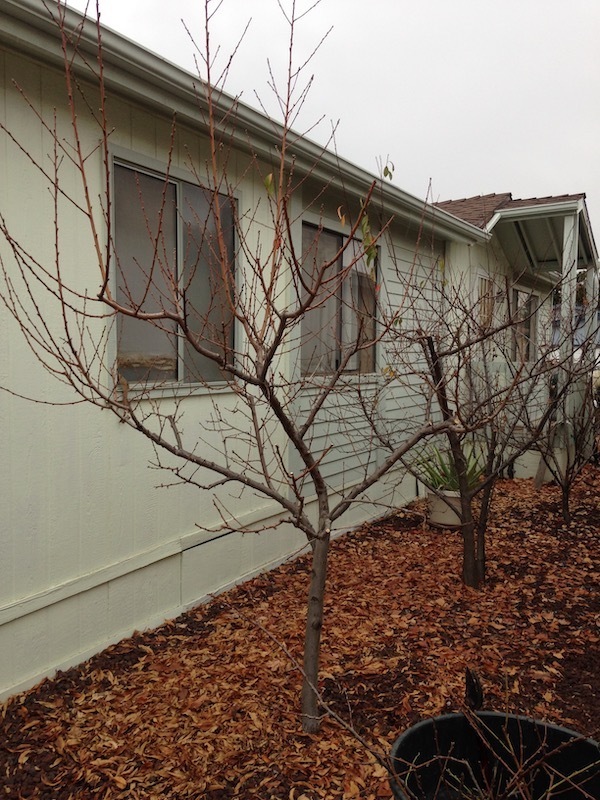 Photo at left before pruning, photo below after pruning, in winter. 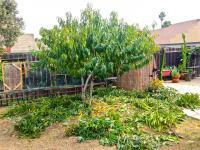 This is a low pruning style. 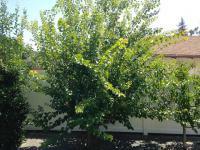 The amount of water this tree is getting is excessive during the growing season. 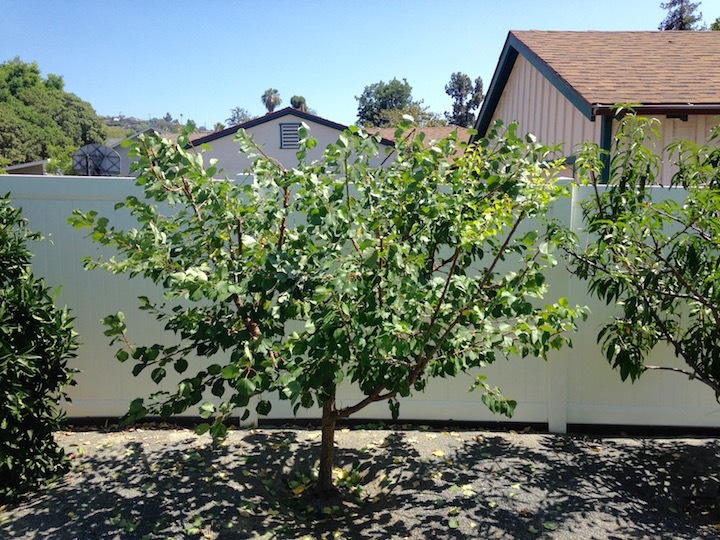 I recommend less water, especially after fruit ripening, so as to not promote so much growth, which is basically excessive, unless one wants a taller tree. 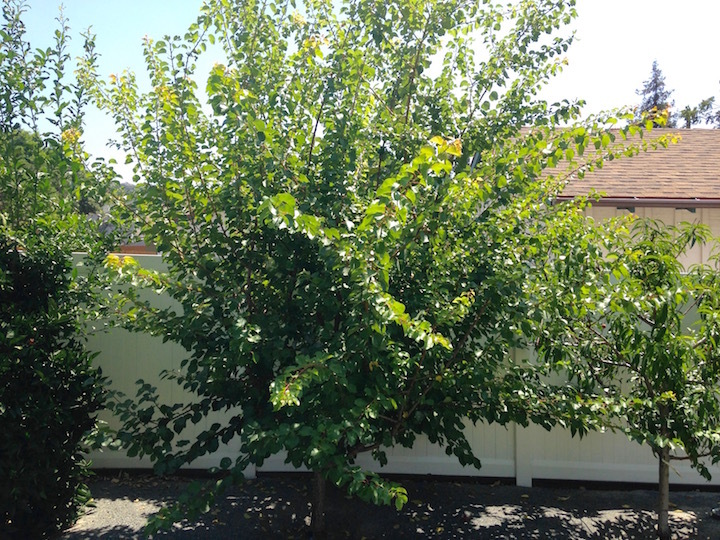 I could've pruned this substantially higher, but, my guiding idea was/is for the tree/bush to bear fruit without the limbs getting overburdened, and drooping, and yet still getting plenty of production. 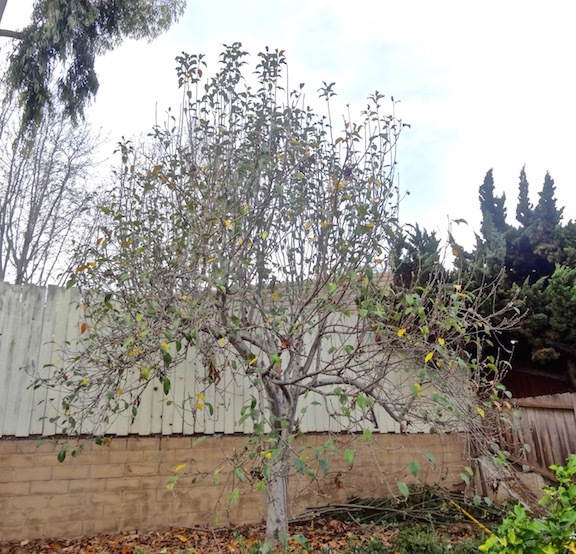 I prune for keeping sufficient amounts of flower buds on sturdy limbs and twigs, for a plentiful crop of high quality fruit. 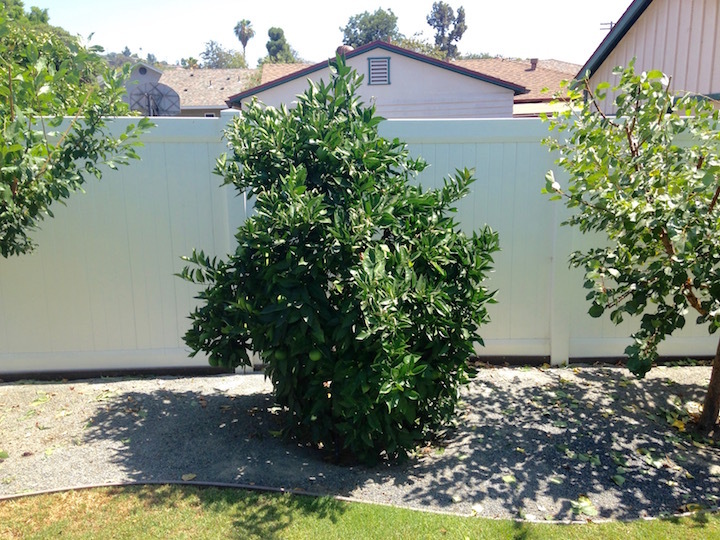 It's also good to do pre-ripening-season thinning of new growth to get more light on the fruit for more skin color and sweetness, if desired. And of course, it's also best to thin the fruit out during the early stage of fruit development, in order to have less fruit, but still plenty of fruit in order to get higher quality fruit, in the sense of a most excellent 'fullsome' flavor with beautiful sweetness, flavor, and texture. Escondido, 2018. 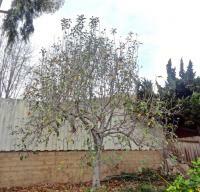 Apricot tree which the owners wanted appropriately substantially reduced. 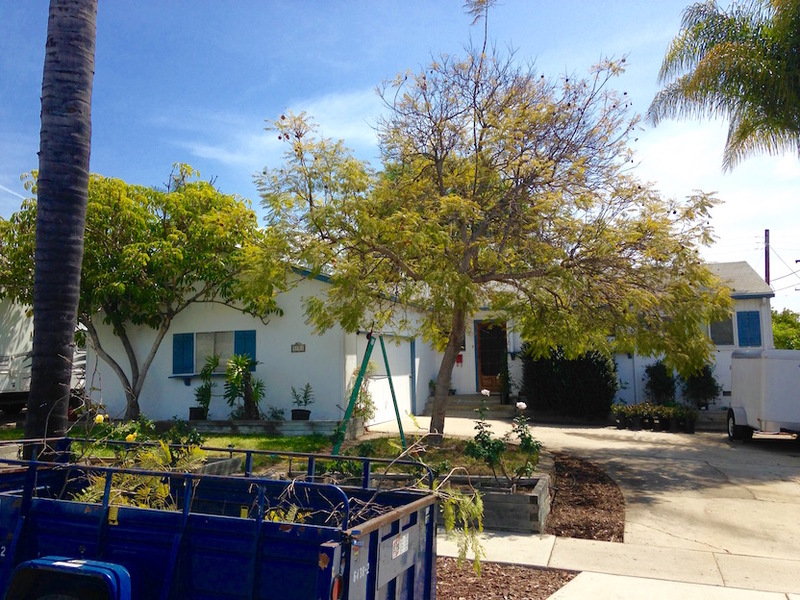 Done in November, per the owners preference, though that's earlier than usual, but it's okay for the tree. You can see the appropriate reduction in the photo below. Long whip lengths were kept to keep more buds through winter, which sparrows may eat before the buds open-flower. 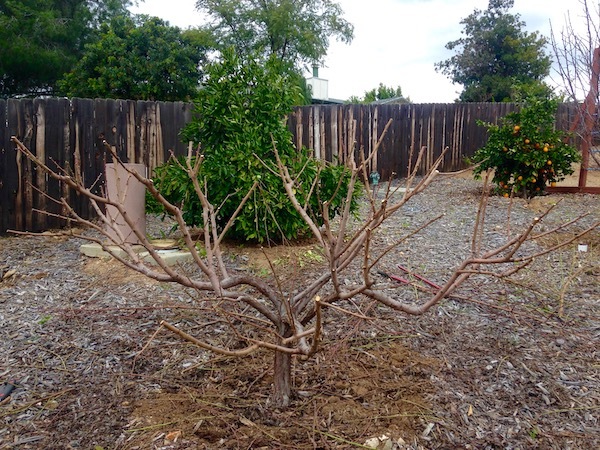 So the idea is to potentially trim the longer whip-lengths during or after flowering time if desired for stronger shorter structural lengths, so as to maximize the amount of buds through winter, and potential flowers-fruits, while still allowing for some bud-eating by the sparrows before flowering. An informal sensitive considerations pruning. 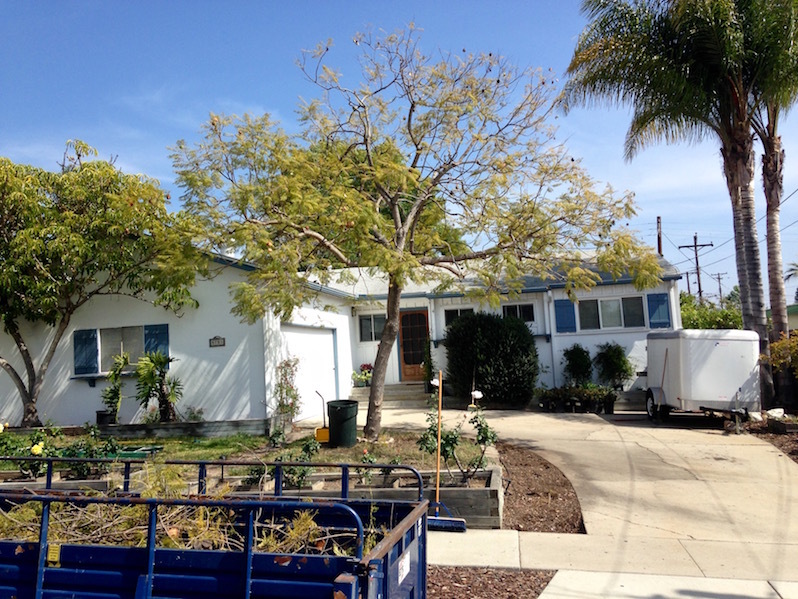 Kensington neighborhood, 2015. Panamint Nectarine about two to three years after planting. So, as you can see it's growing rather modestly, not excessively, which is good.. 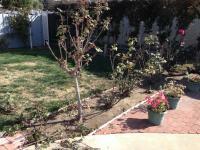 Photos showing before pruning at left, and after pruning below. 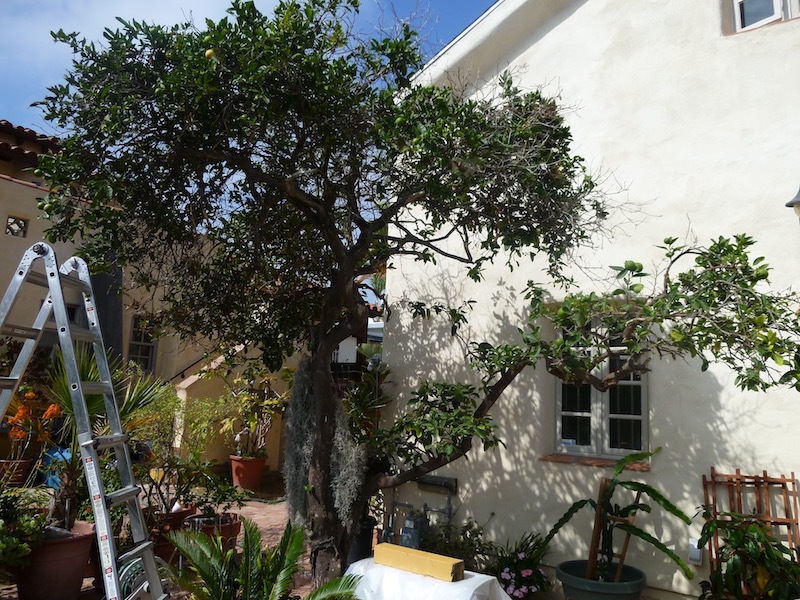 The purpose of the pruning is to cut the limbs/twigs to firmer/shorter lengths in order to better hold and ripen the fruit, for better fruit quality of more size and 'fullsome' flavorfulness and juiciness. Santee, 2017. 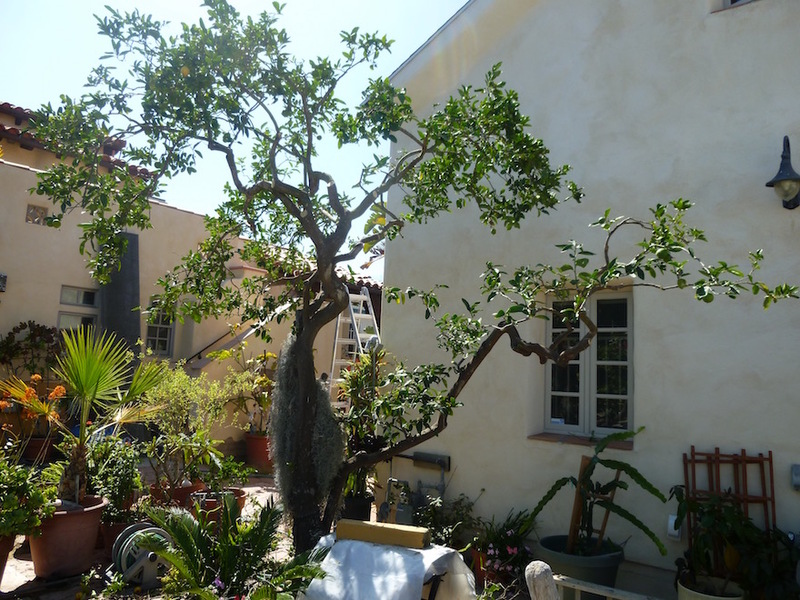 Orange tree at beginning of getting a 'makeover', some limbs already cut off. Bonita, 2008. Orange at completion of 'makeover'. 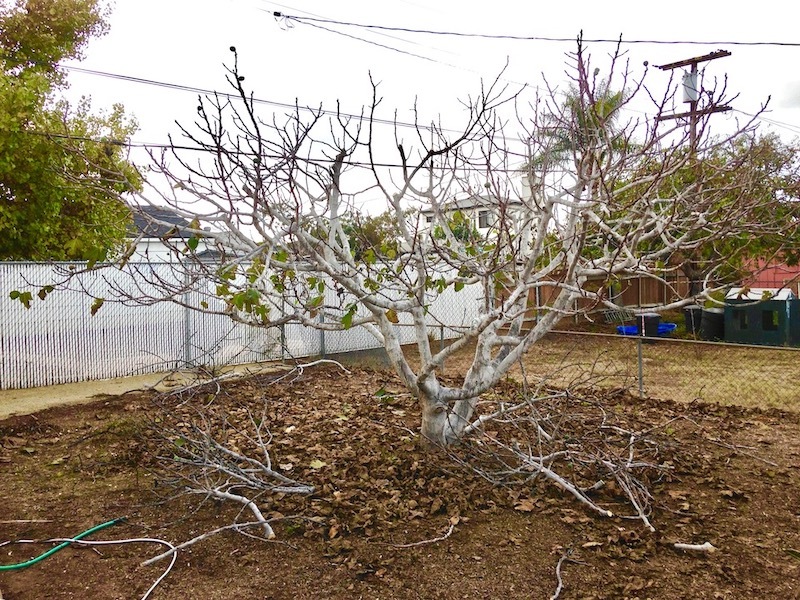 Pruned/laced/shaped/groomed: cut out the dead and low vitality twigs, limbs, and other branches that weren't well positioned(which were the majority of what was cut out), and painted the sun-exposed bark with white latex paint. 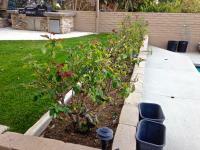 The problem with the tree mainly was that the watering practice wasn't appropriate enough. 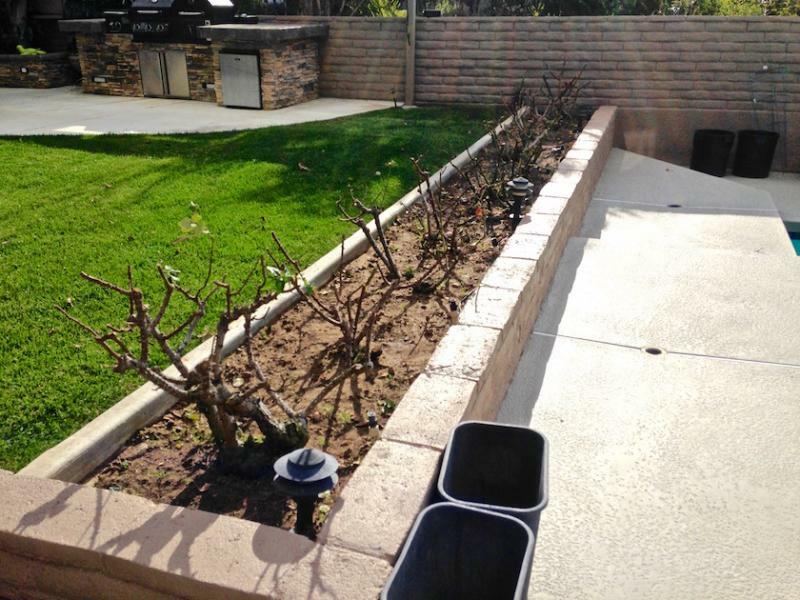 It needed more water less frequently: instead of three 10 minute waterings per week on three separate days, make it one 30 minute watering one day per week. Also enlarged the basin a foot + in width, and added a layer of mulch. Bonita, 2008. 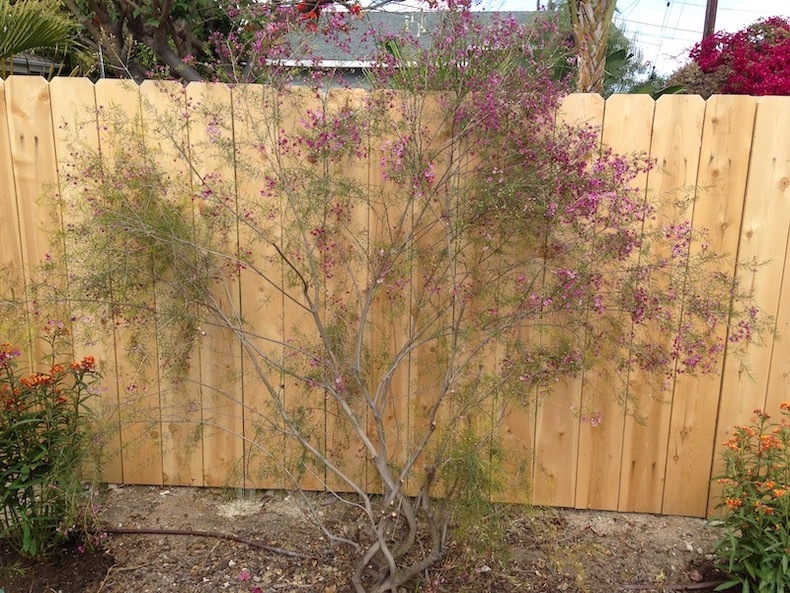 Showing before and after photos of pruning-grooming Geraldton Wax Flower (Chamaelaucium uncinatum) in San Diego landscape. 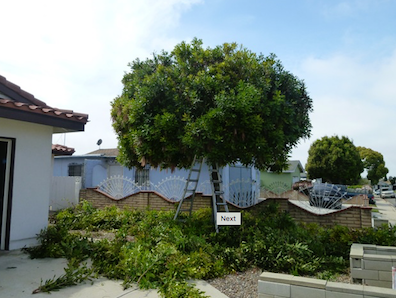 Before pruning photo below, after pruning at left, - click on photo to enlarge small photo (note: Coleonema shrub at lower right of left side Chamaelaucium was planted after the pruning was done, the following day). 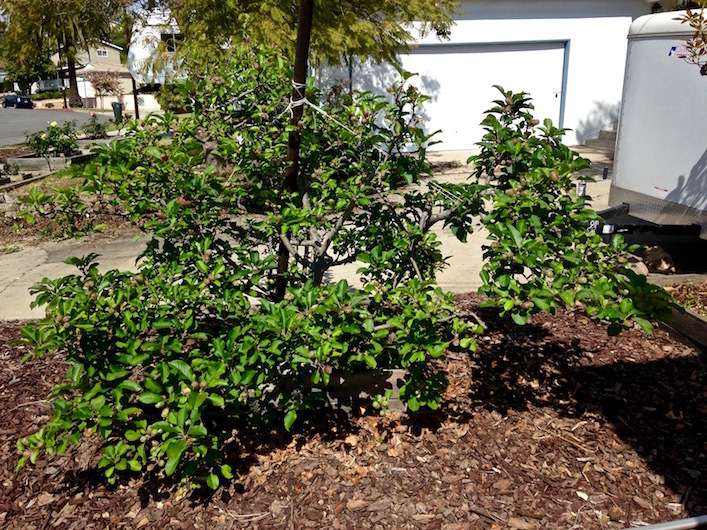 Young peach tree before pruning at left and after pruning below. 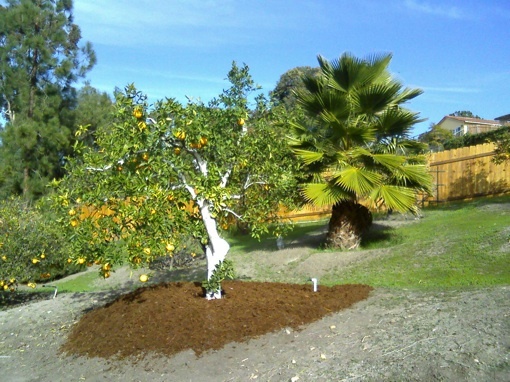 The reason for the cutting back is to keep the branches firmer for holding fruit, so the branches won't sag substantially, and reducing the amount of fruit set in order to improve fruit quality, though thinning will also likely be necessary after fruit set when they reach about 1" in size in order to get better/best quality fruit, leaving at least a fist spacing between fruit when they're at that 1" size in order to allow full development without likely touching when the fruit is mature. 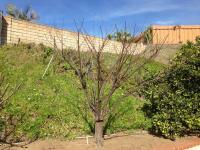 And pruning is of course also done for size control. 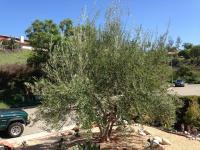 Olive tree, Fletcher Hills, 2008, reduced about 5 feet in height all around, some dead and near dead substantial-limb removal, lacing/thinning, and removal of a few substantial low limbs. Forgot to take before picture. I was contacted initially because of the owners concern about some dead limbs. 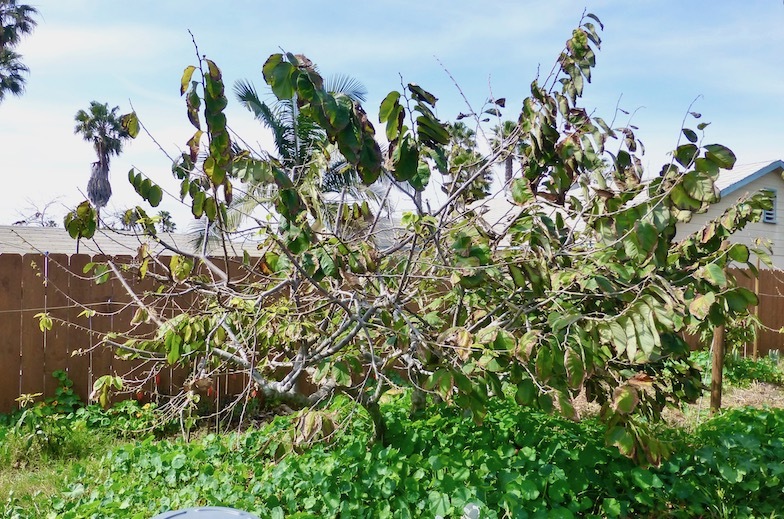 The dead limbs were likely caused by a soil-transmitted disease called Verticillium Wilt, which translocates through the tree and can cause random die-off of limbs and twigs, with dead foliage usually still attached. Occurrence of die-off is variable. It can be either a little or a lot. 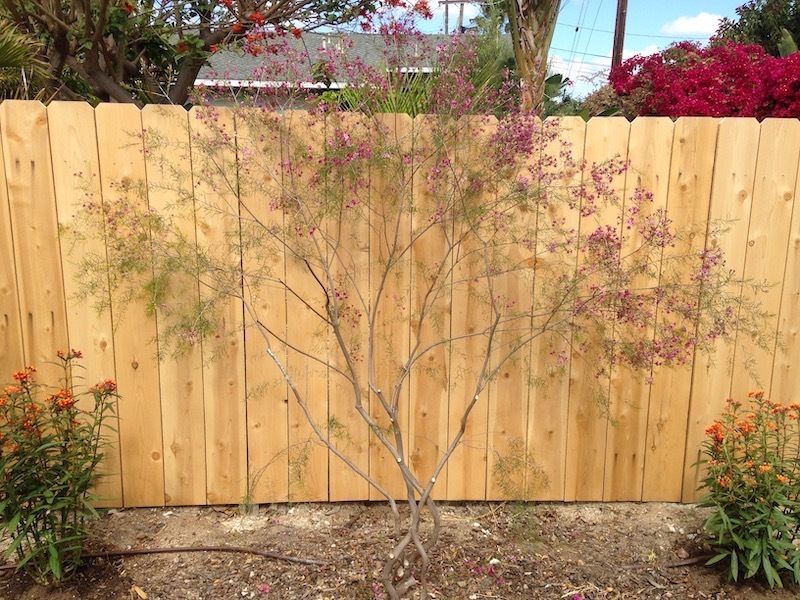 Only effective management is trimming/pruning. 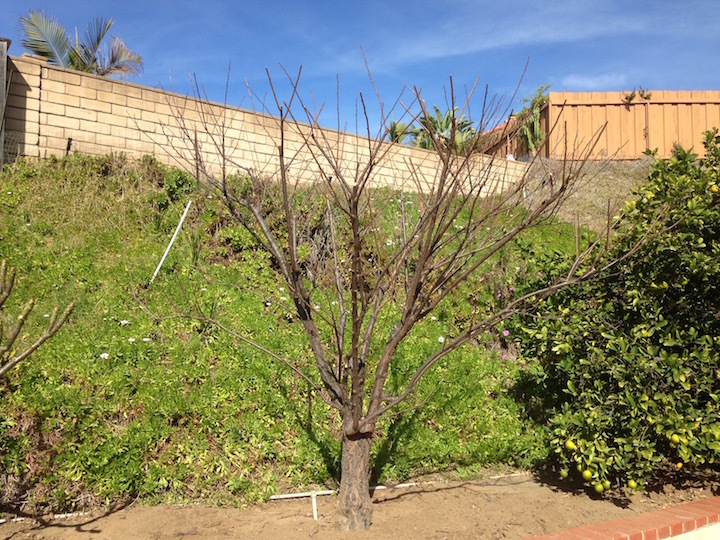 Santa Rosa Plum, after pruning, 2018, in Rancho San Diego. Before photo wasn't taken. Same pine as photo 34, just before second thinning-pruning. Peach tree at beginning of pruning. Kensington, 2012. 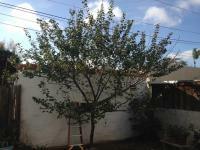 Same tree as photo 24 after pruning, though photo taken about a month after pruning job. 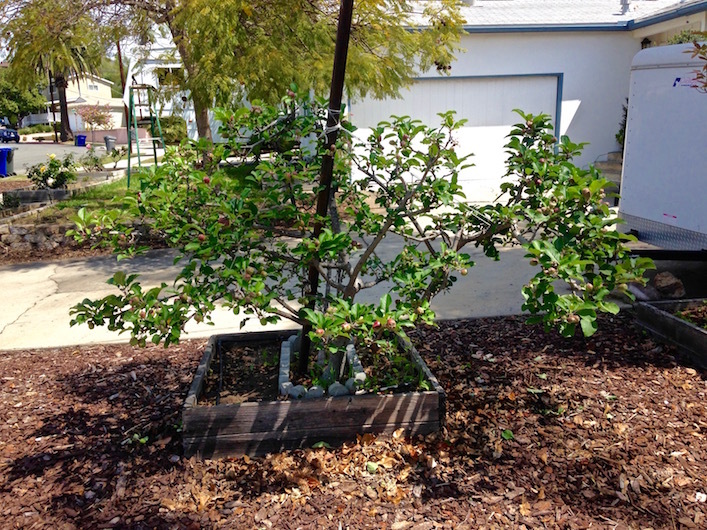 A bit of flowering and leafing have begun in this photo. Kensington. Macadamia tree, at beginning of pruning in photo at left which you can click on to enlarge. After pruning, and before cleaning up, in photo above. 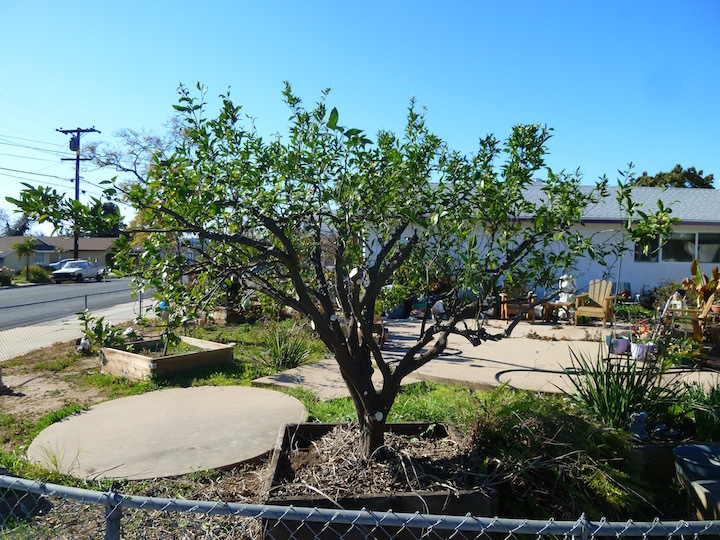 Chula Vista, 2013. 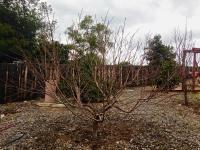 Snta Rosa Plum after pruning, August 2018. Before pruning photo at left, which you click on to enlarge. 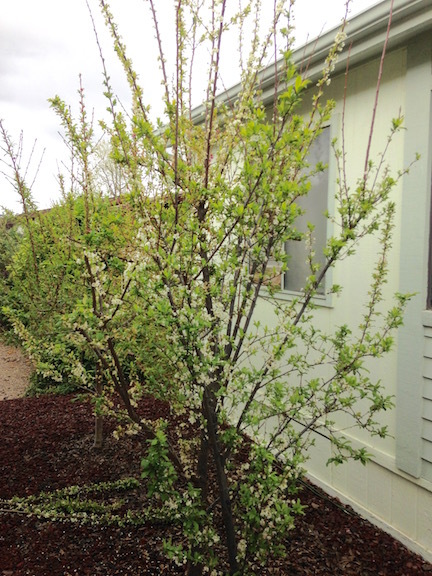 The plum was getting too big for the space, in part due to too much watering, and so I also turned off the nozzle which was watering it. 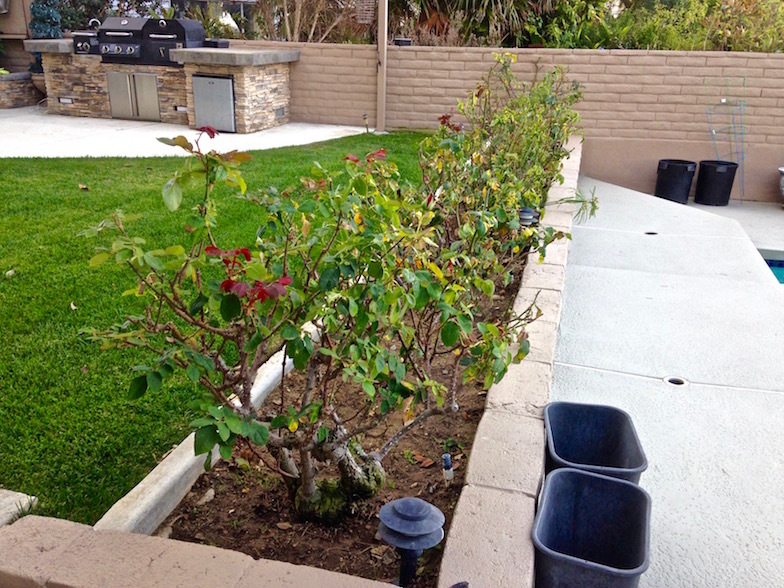 For this site location, it's a good bet that it may not needed any further direct watering, in part due to the large lawn immediately in front of it and the site location being in a low lying area, and thus the soil is likely to have longer water reserves in the deeper soil (than I higher elevation site) which is still within access by the roots. 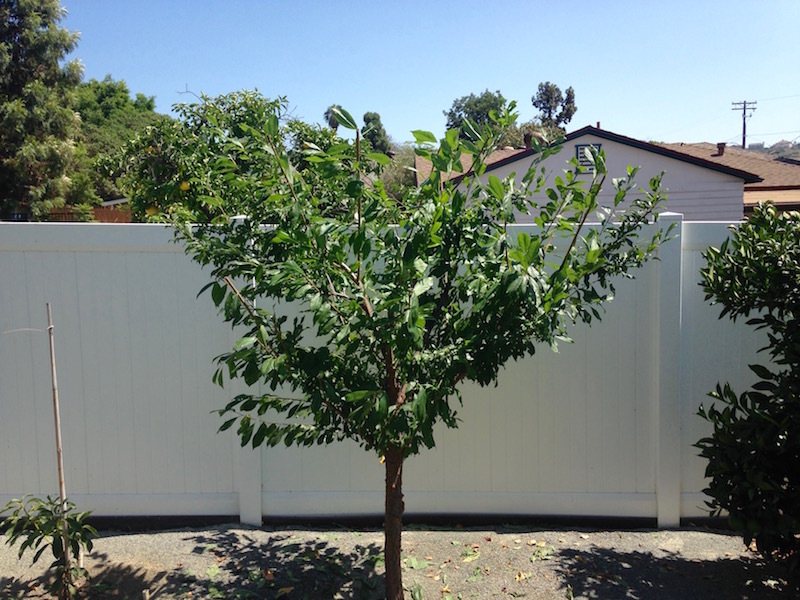 An additional reason is the small space for the plum to grow in nicely, to be kept 'well-kept', and not too large for the space. 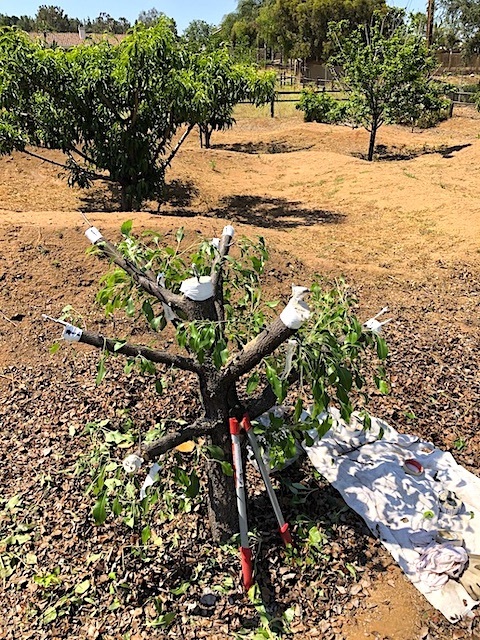 It's likely that two to three times per year pruning will be best, such as in summer after fruit ripening time, winter during dormancy for some refinement of the pruning, and then possibly some pruning before the fruit ripen. 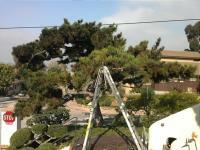 Old Japanese Black Pine at beginning of pruning, with purpose to thin it out substantially, 2011. 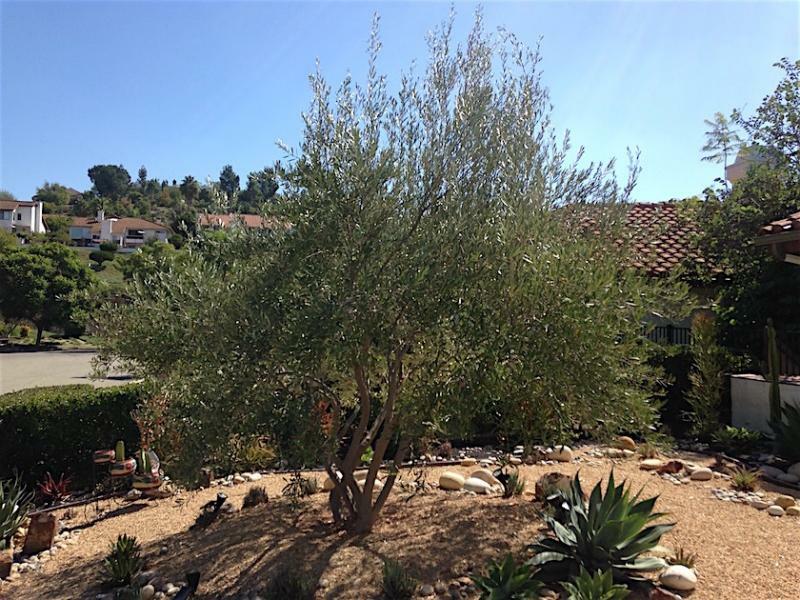 Slightly different angle after pruning. 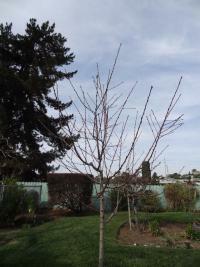 Midpride Peach, kept dwarf, under 7 feet, grafted onto Apricot seedling, growing in situ in ground, in 1994. Photo, June 2012. 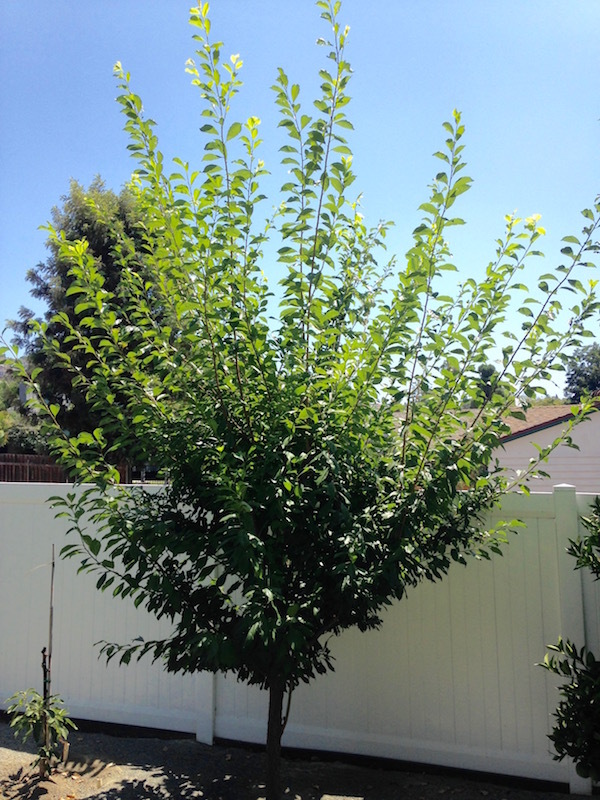 Peaches, nectarines, apricots, plums,... all can benefit from a pre-ripening-time pruning to get more light on the fruit for more color and sugar development, especially if it is desired to keep the tree relatively small, say under 7'. And it can also be good in some cases to do post harvest pruning sometime in summer, as appropriate, for more light on the twigs and branches for stronger twig and bud development for best fruit production the following year. 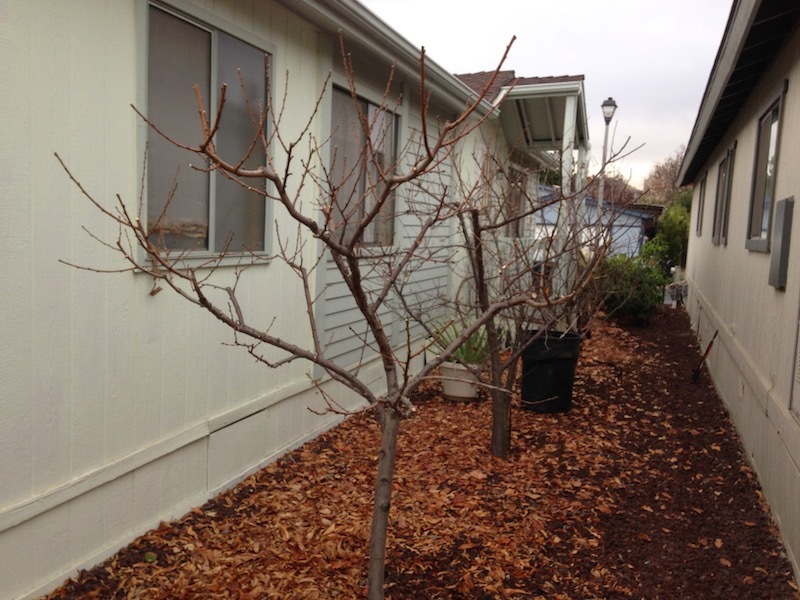 Winter pruning can then be done for refinement. 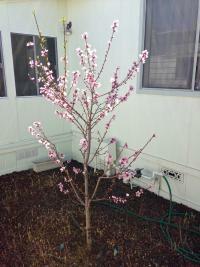 And then in early spring, peaches and nectarines with abundant fruit set should be thinned substantially for best fruit development and quality, - at least 6 inches between each fruit, at mature size, for best quality(so make good estimation of mature size at the early spring fruit thinning time). 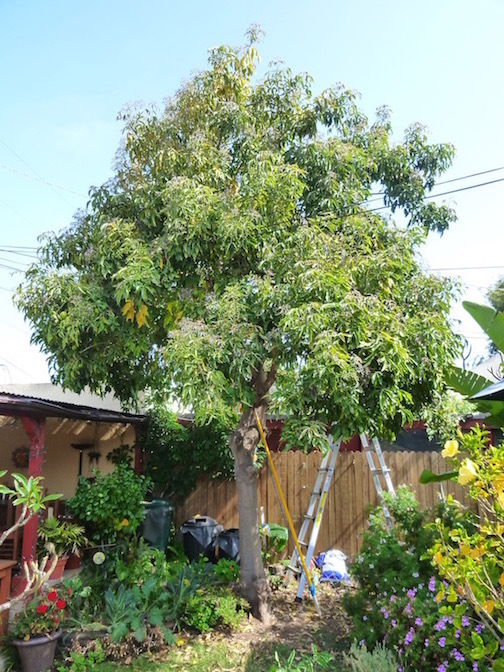 Showing Tabebuia chrysotricha (aka Handroanthus chrysotrichus), a yellow flowering small tree, wherein it had two codominant stems, which created a narrow crotch shown in the close-up photo. Narrow crotches/attachments such as this, having a 'v' shape, with 'included bark', are relatively prone to breaking-off through a combination of weight stresses due to growth weight and/or strong winds. 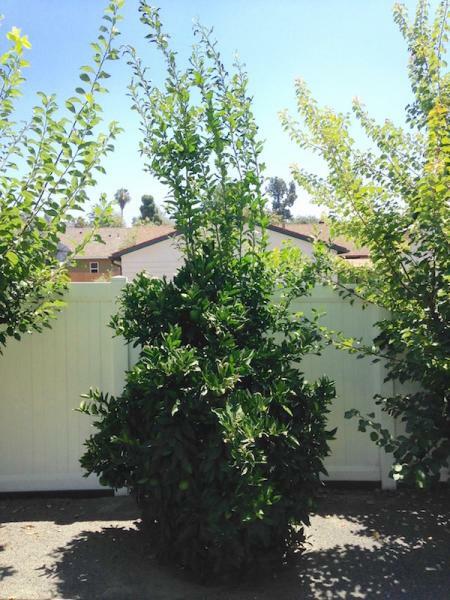 The portion that was cut off was nearly half of the canopy-crown. 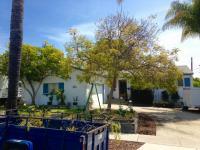 The portion that remains was determined to be more substantial and even in distribution. 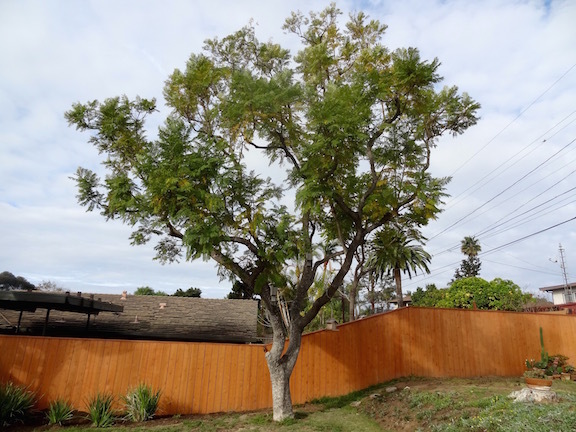 I was called in to diagnose and correct this structural situation, and so I decided to cut out the lesser desireable portion, and brace the remaining portion and trunk, in order for the remaining portion to take on a balanced central postion. Btw, I didn't consider taking a before photo, - woops. The staking positions were re-done along with the multiple points of bracing as necessary to make for a straight trunk and centered canopy. In the full length photo at left the v-crotch is at the second-from-top rubber brace. In time, maybe two to three years, the tree will strengthen its structure and be self standing without staking. Same pine as in photos 1-2 in late December 2012, last pruning was April 2010. 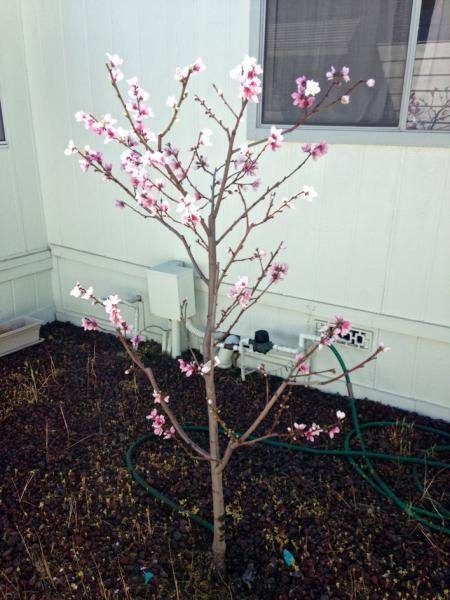 Young Panamint Nectarine before pruning. Linda Vista 2014. Young plum tree, before summer pruning. 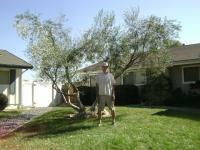 After pruning in photo at left, which you click on to enlarge. 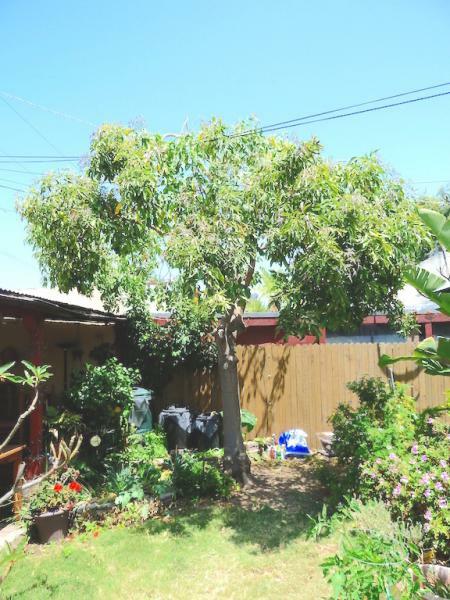 Trimmed back for the purpose of cutting back the lanky growth, to keep the plant smaller, and the smaller growth should have plenty of flower buds develop, and produce plenty of fruit. 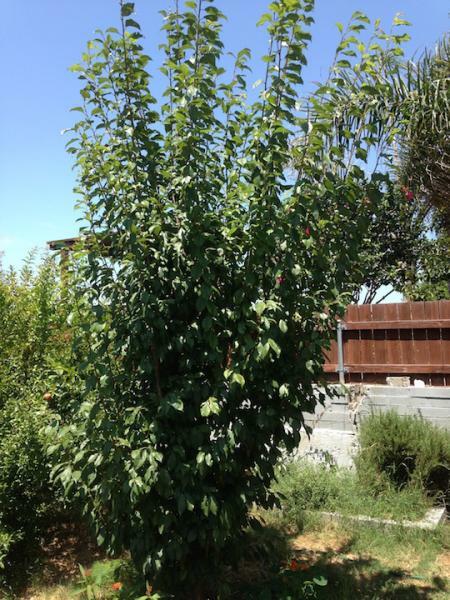 Santa Rosa Plum. Summer 2017. 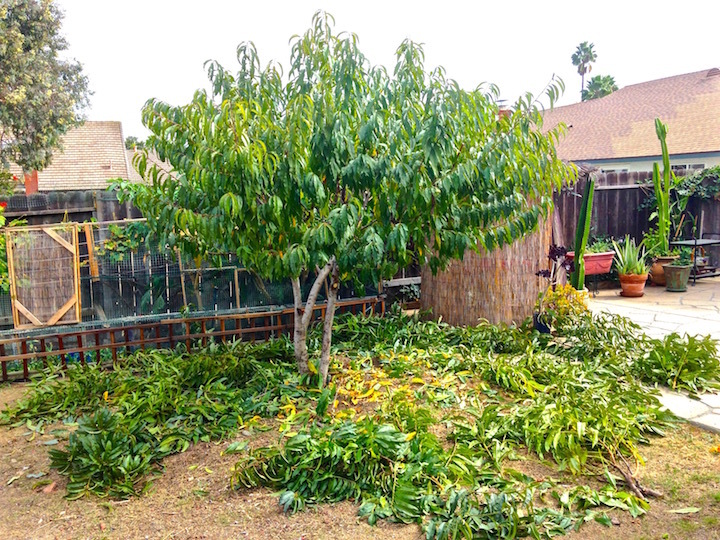 Apricot pruning in August 2018, summertime, in La Mesa. Before photo at left, which you click on to enlarge. 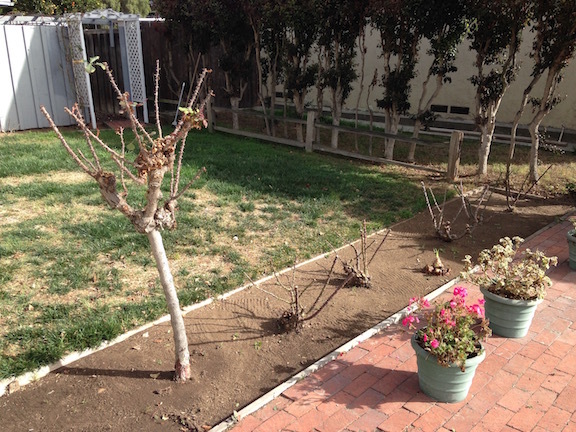 Pruned because the apricot was getting too big for the space. 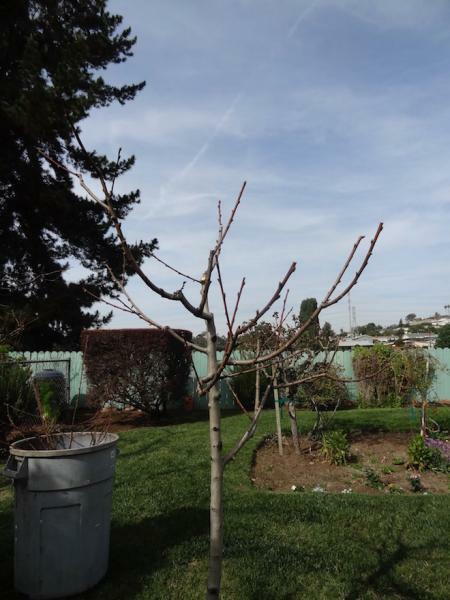 And so, I recommend(ed) no more direct watering to the apricot because the roots are well distributed, there's a large lawn in front of the apricot and, the site location is in a low area which makes for more water retention in the lower soil levels, typically speaking. 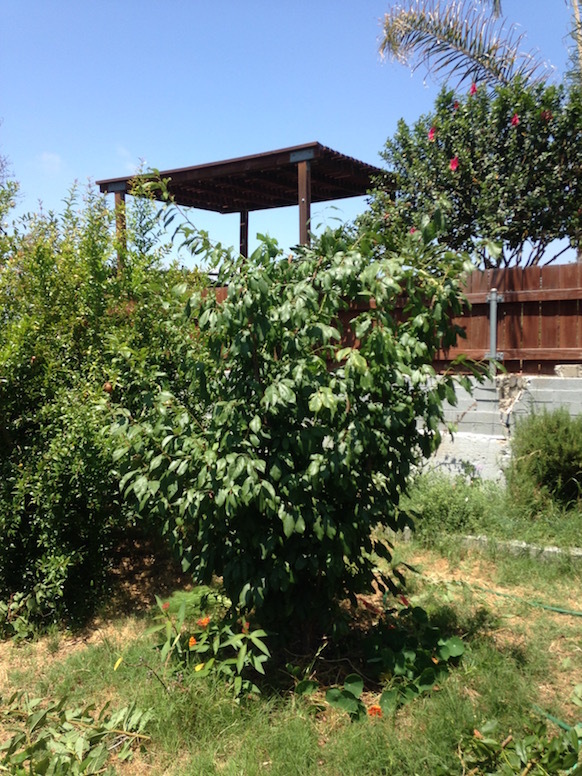 It's a good bet that no further direct watering will be necessary for this apricot, because only 'just enough' growth is necessary for good production, - there's no advantage to having growth which is excessive for the space, and also for the matter of strong structural integrity for the tree. And, time will tell, response/results will show. 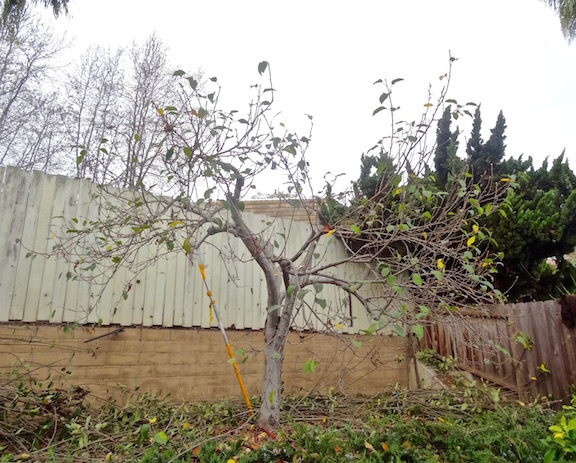 Pruning frequency can be as often as pruning after ripening in summer, winter dormant pruning for refinement, and possibly some pre-ripening pruning; case by case determination. Jacaranda tree, reduced per client's desire. 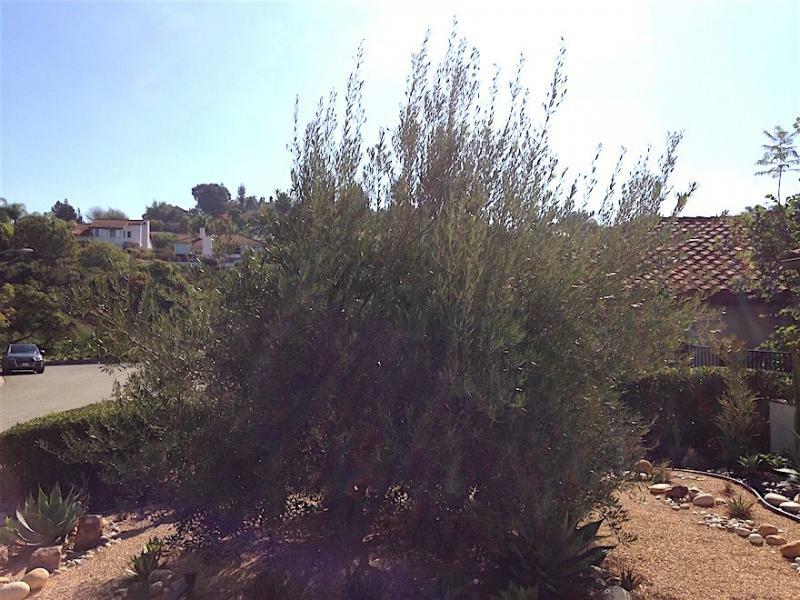 La Jolla, 2014. 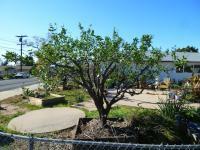 Appe tree, Chula Vista, 2014. 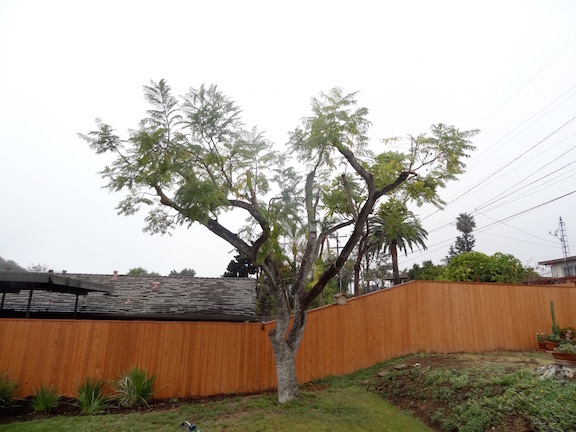 Client wanted tree reduced modestly, after years of no pruning; not really detailed pruned, just informally reduced. Cherimoya big-bush 'tree', April 2018, at pruning time. 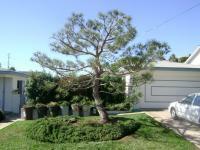 Small enlargeable photo at left is before pruning. 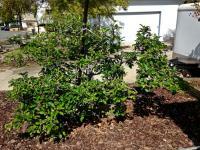 Photo below is after pruning. 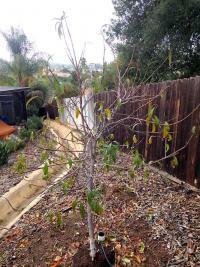 There are three varieties which I grafted onto this Cherimoya, and which have produced for many years: Nata, El Bumpo, and a Madeira island variety I call 'Kraka', because the fruit usually majorly cracks on the tree, though the fruit flesh, which has a mild pleasant pure fruity flavor, is good when it softens up. Nata and El Bumpo have typical good/great cherimoya, pineapple-banana flavor. Nata is more fine grained flesh, El Bumpo is larger grained flesh. El Bumpo is more sweet pineapple flavor with some tang, Nata is more rich n smooth, very sweet, with some tang.